This is the principle reason why California has a water shortage: agriculture where it shouldn’t be. 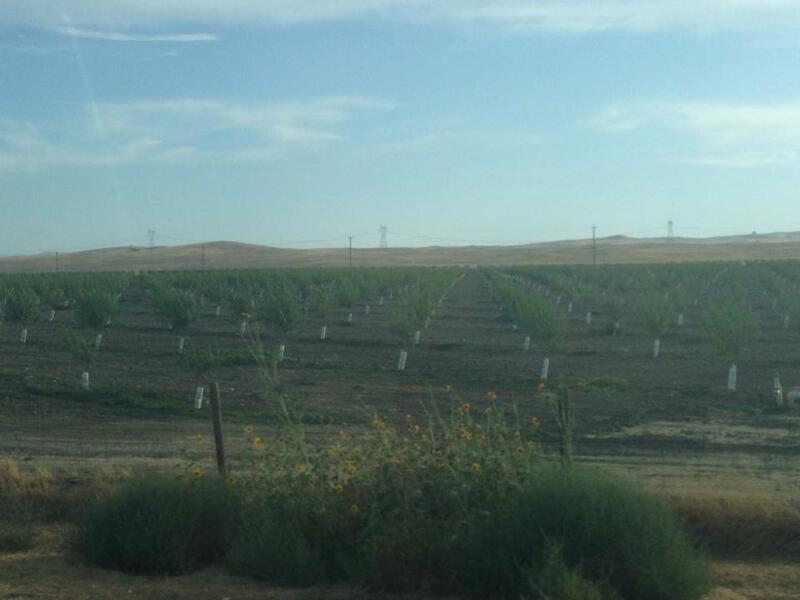 One side of the freeway is the natural, unirrigated terrain; the other side is irrigated almonds. We should never be growing luxury crops in desert climates. We’re in the San Joaquin Valley. There’s no natural source of water here, like in Chico; these almonds have to be watered about three times the amount of the trees in the northern Sacramento Valley. There are very few places in the world where almonds can be grown; the trees can’t freeze in the winter, must have lots of water, sunshine, and a long growing season; the Central Valley of California (Sacramento and San Joaquin Valleys combined) is ideal, climate wise. But water in parts of the valley is another story. Irrigation for crops isn’t universally bad or causing the drought, by the way, but growing luxury crops in places where they shouldn’t be grown, where there isn’t enough water for basic health and safety needs to be met, is perilous. Luxury crops are crops that aren’t essential for nourishment and are sold for significantly higher prices than staple crops. An example of a luxury food product is lobster. You don’t have lobster every night for dinner, correct? It’s a splurge or a luxury; it costs more, it’s not readily available, and only grows well in certain parts of the world. A staple protein substitute for the lobster might be chicken eggs; they are easy to raise, readily available in nearly every part of the world, and fairly inexpensive, even organic eggs, but especially of you raise your own chickens. You need protein but how you get that protein can either be a luxury or a staple. There were no almonds here or other large scale orchard crops before the California Aquaduct was built.in the 1960s. If these almonds were feeding local populations, I’d probably have less of a problem with this new growth of almonds in the southern San Joaquin Valley. Or if these new orchards were creating jobs that otherwise wouldn’t be here. But they aren’t. Almonds are highly mechanized in production and harvesting. The jobs created by orchard crops could be put to work in more sustainable crops that require less water and can be laid fallow in times of drought (corn for human consumption, tomatoes, squash, melons) that would be consumed locally or even in the US. But they’re not; about 70% of California’s almonds are shipped overseas. This is business, this isn’t farming. The U.S. agricultural complex grows more food than we can ever use in a given year; we have the ability to grow plenty of local food, if we used it correctly and then didn’t throw away so much food needlessly. Californians are going to have to shift their thinking about water, even the wealthy ones who don’t care how much water costs as long as their grass is green (and mostly useless in the average residential setting). I turned half my backyard into a vegetable garden this year and have been feeding my neighbors and friends with tomatoes, cucumbers, and a ton of other veggies. It’s amazing, but I don’t miss the grass I tore up at all. It’s a shift in use and ideology. My stomach hurts as we drive farther on Interstate 5, south from Stockton, Westly, Patterson, Los Banos, through Kettleman City, on toward the Grapevine. All around us, the landscape is polka dotted with dead orchards and brand new baby trees, evidence of one farmer losing his or her water rights, while another finds a way to water the desert enough to plant a new orchard. It’s gut-wrenching to see the wasted trees, the wasted water, the cost for farmers (about $10,000 per acre to plant new trees), and the risk that everyone takes, when we demand luxury crops grown in the desert. 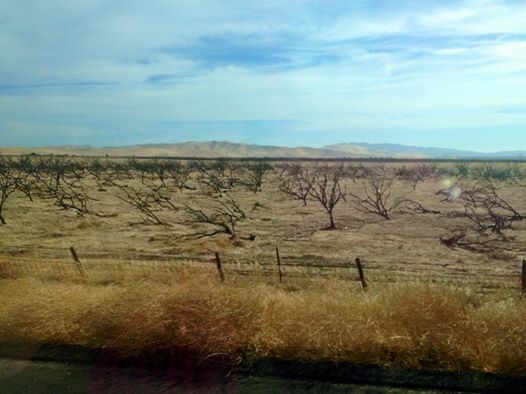 Dead orchards, abandoned in the crunch for water and a few miles later, brand new orchards. ‹ PreviousCivility is Why Administrators are Paid the Big Bucks!